You have a dilemma. Your 1958 to 1967 Corvette radio plays perfectly but the exterior face of it looks terrible. The bezel is pitted. The selector slider is worn and the buttons are loose or missing. The repair for these problems is very simple. Just make a call to Zip Corvette Parts, 8067 Fast Lane, Mechanicsville, VA 23111, 1-800-962-9632. They now have a Corvette Radio Faceplate Kit. This Kit includes a new chrome faceplate, faceplate lens, push bar or selector bar and 5 buttons. This Kit is easy to install and will renew the face of your Corvette’s radio turning it from a fading star into a shining star. We installed a Faceplate Kit on our Project 64 Corvette’s radio. It went on easily and only took a few short hours. So let’s get started and give our radio a much needed facelift. 01: Here is our Corvette Radio Faceplate Kit. It includes a new chrome faceplate bezel, faceplate lens, selector bar and spring, chrome buttons and set screws. 02: Start by removing your radio from the dash as per your Corvette shop manual. Now remove the faceplate retaining screws and carefully lift off the faceplate. 03: Remove the buttons next. These are sometimes hard to remove. You may have to use pliers or vise grips. Here we also used small pieces of wood so that we did not totally destroy the old buttons. Also remember to pull the buttons straight off. Do not rock them back and forth. This could damage the button mechanism. 04: Since we wanted everything to look new, we refinished the metal background area on the dial. Tape and paper off all of the surrounding area. Then use 1000 grit paper to remove any rust or scale. Light, even pressure should be all that is needed. After it is sanded, use Semi-Gloss Black spray to refinish the background plate. 05: Carefully remove the Corvette faceplate lens retaining clips. These will have to be re-used on the new faceplate. 06: Assemble the new radio faceplate by installing the selector bar. Align the two tabs on the back of the bar with the slot in the faceplate. Place the flat retaining spring down over the tabs and onto the stepped area of the slider bar. 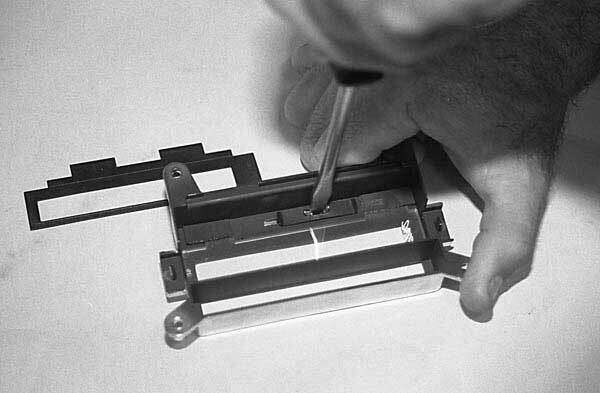 Now place a screwdriver down into the selector bar slot between the tabs and carefully spread the tabs slightly apart. Break off the top legs of the tab. Now the selector bar slider should be held in place by the retaining spring. 07: Place the faceplate lens and backup metal plate into the faceplate and re-install the retaining clips. 08: Install the new radio push button knobs. Make sure the button stems are fully extended. Hold the stem firmly in place with a pair of needle nose pliers. Slide the new button onto the stem making sure it is all the way down onto the stem. 09: Use the supplied set screws to secure each button onto its stem. 10: Align the slot in the selector bar slider with the selector arm shaft and carefully install the faceplate onto the Corvette radio. Now re-install the faceplate retaining screws. Move the selector bar back and forth and check to make sure the dial is changing as it should. 11: Here is our Corvette’s radio all assembled with its new faceplate and buttons ready to be re-installed. A quick and easy way to give your aging Corvette radio a new facelift.